A reader of my blog recently directed me to two excellent books about the Christian tradition of geometric patterned art. 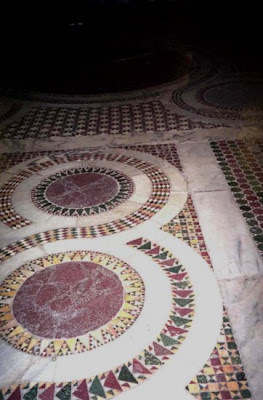 The first is one has actually been mentioned here on the NLM before, Cosmatesque Ornament: Flat Polychrome Geometric Patterns in Architecture by Paloma Pajares-Ayuela. 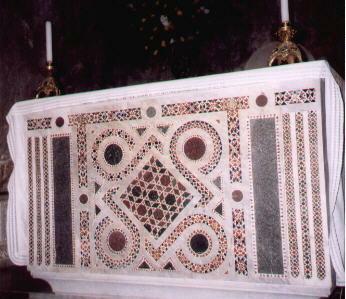 This book focuses on the opus sectile work of the 12th and 13th century charaterised by coloured stone. With systematic thoroughness and hundreds of diagrams and gorgeous photographs, it explains the design schemes of all these patterns, the symbolism of the geometry and mathematics behind them and the colour schemes used. The author has gone to the trouble of researching every church that has examples of this work. As he points out, 'The principle focus of Cosmatesque ornament, central Italy, is home to 91% of Cosmatesque cities. The 62 cities of central Italy contain 183 Cosmatesque monuments; 85 of these are in the capital city of Rome.' He lists every church in existence that has such patterns, including the only one outside Italy, which is Westminster Abbey, in London. The book sets the scene historically, explaining the classical Roman, Byzantine and Islamic influences on the design schemes. It devotes a whole section to analysis the quincunx, the quintessential Cosmati design. This is the design of four circles, spinning out of a larger 5th circle. The one shown top left is Santa Cecilia in Trastevere, Rome. It devotes special detailed attention also, as an exemplar, to the pavement of the Schola Cantorum in the church of San Clemente, Rome. Cosmati work, named after the family that through several generations pioneered the style, is not the only form of geometric patterned art in the Christian tradition. However, like all gothic design, it is a form integrated with all aspects of Christian culture and is run through with proportions and harmonies that echo the patterns and rhythms of the liturgy. This makes them especially good starting point. Being a lover of all things gothic, it appeals to my taste as well! For those who want a slightly broader perspective, there is a second book Italian Pavements: Patterns in Space by Kim Williams. 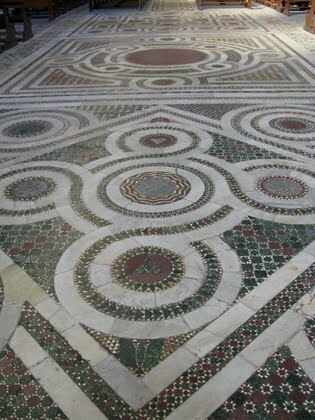 It examines patterned pavements in both mosaic (which is composed of tesserae - many small pieces of glass or stone of similar size and shape) and opus sectile ( literally 'cut work' where the stone, usually porphyry or marble, is cut to a precise shape). Also it considers designs ranging from classical Roman to Baroque, rather than just a two-hundred year period. What makes it a useful complement to the other is that it describes how to draw some of the more complicated designs that it describes. I am not aware of anyone who is capable of producing work that compares with this today, but I am hoping this might inspire and help someone to do so in the future.